"we tolerate and even appreciate the way our differences intermix to enrich the overall fabric of our society. We respond with compassion for the suffering of others while maintaining gratitude for our own blessings. In spiritual maturity we would honor the notion of all of us being connected despite our differences. These two authors have done a great service in calling Americans to awareness about these truths." Two authors, childhood best friends, now divided by their religious beliefs—and lack thereof in one case—found themselves similarly affected by the Donald Trump campaign and early presidency. 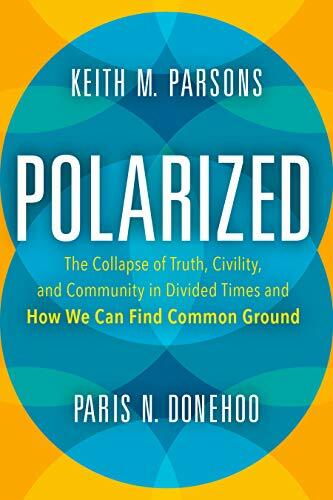 Together they have authored Polarized as their response, focusing on three main values both authors find lacking in our society: truthfulness, civility, and unity in diversity. Lack of appreciation for these values among Americans, they claim, enabled the election of our 45th president. Blatant disdain for these values, they further contend, is most egregiously exemplified by him. The authors hold a reader’s interest by taking turns addressing each of these three themes and offering a prescription to improve society by making these qualities more prominent in the average American value set. Parsons, writing from the perspective of a secular academic, elevates truthfulness over mere personal honesty, by insisting that truthfulness requires a person to hold others accountable when they lie or mislead. “A respecter of truth will neither lie nor tolerate lies.” In hope of restoring respect for truthfulness in our society, Parsons calls upon the media to expose the motives of those promoting untruths about climate change, voter fraud, and other hot button issues, and to call out those who put forth these lies instead of hiding behind a faux impartiality. Donehoo, a Protestant pastor, calls readers back to the true example set by Jesus, contrasting this sharply against the values being honored today by the so-called “Christian” right. To restore respect for truthfulness in our current society, rather than argue with the Christian right, or try to convince them to interpret their Bible metaphorically, Donehoo recommends that (progressive Christians at least) use the Bible to inspire right wing literalists toward more inclusive values. To recover civility in society, Donehoo once again refers us back to the Bible, while Parsons appeals instead to Aristotle. Included within the civility pages is an excellent explanation for why our society tends to dismiss the goodness values: “Most people are not reflective.” They have neither the time nor the inclination to think out positions in detail and thus are subject to coercion by the sometimes (often?) dishonest methods of politicians skillfully scheming to control them. Parsons points out that a nation’s greatest strength comes from its diversity, and it is on this concept that he would build American community. Donehoo builds his argument for unity around the practice of loving one’s neighbor. Their strongest case is for focusing people on commitment to the common good. They aptly point out that people unite best in service to others. In choosing unity as one of their core values, Donehoo and Parsons have hit on a really key concept. Unity is the endpoint of all spiritual paths and yet large numbers in our society have never had its importance impressed on them. Spiritual maturity brings a person into an increasing sense of unity with a greater number of people and connection with a greater portion of the universe. Yet because many people remain unaware of the spiritual path, unity is rarely taught, encouraged, or even mentioned as a value. Instead, whole segments of our society gloat with a triumphal sense of superiority over those who differ, delighting in promoting divisiveness and blaming those less fortunate for their own suffering. These authors use the term unity in diversity. With a sense of unity we do not need to have everyone mirror our lifestyle, beliefs, or culture to feel connected to them, and to want the best for them just as we wish the best for ourselves. Instead we tolerate and even appreciate the way our differences intermix to enrich the overall fabric of our society. We respond with compassion for the suffering of others while maintaining gratitude for our own blessings. In spiritual maturity we would honor the notion of all of us being connected despite our differences. These two authors have done a great service in calling Americans to awareness about these truths.